With over 50 years of combined real estate experience & quality service, Mark and Patty have what you're looking for. Dedicated professionals with a personalized approach putting your home needs first, offering constant accessibility. Full-time licensed Realtors in Wisconsin and Michigan covering Oneida, Vilas, Lincoln, Price and Gogebic Counties. We specialize in representing our customers and clients in the purchase and sale of properties from vacant land to vacation and waterfront cottages, lakefront homes, log homes and resorts to commercial businesses throughout Northern Wisconsin. Team Millen is committed to exceeding your expectations so you will not only want to do business with us again, you will want to recommend us to your family and friends. A Team Concept bringing you constant communication, customer-focused service and Results with Professionalism and Intregity! Mark and Patty truly love the Minocqua area, including the surrounding areas of Arbor Vitae, Woodruff, Lake Tomahawk, Hazelhurst, Lac du Flambeau, Boulder Junction, Manitowish Waters, Presque Isle, St. Germain, Eagle River and more. We pride ourselves on our knowledge of the areas. Northern Wisconsin offers thousands of quality lakes, State Forests, groomed snowmobile trails, skiing, paved bike trails, ATV trails and more. We have all vacationed in Northern Wisconsin for many years prior to choosing this area to live full-time. © 2019 North Woods MLS. All rights reserved. Information deemed to be reliable but not guaranteed. The data relating to real estate for sale on this website comes from North Woods MLS and the Broker Reciprocity Program.sm. 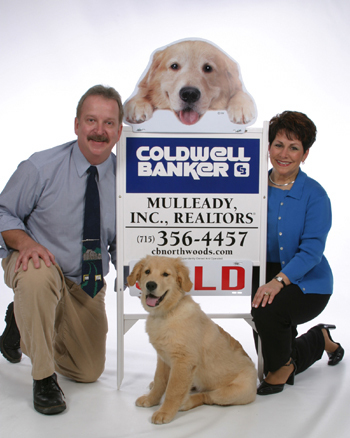 Real estate listings held by brokerage firms other than Coldwell Banker Mulleady Realtors are marked with the BR logo and detailed information about them includes the name of the listing brokers. Listing broker has attempted to offer accurate data, but buyers are advised to confirm all items. Information last updated on 2019-04-18.